2 Bedroom Semi Detached House For Sale in Aylesbury, Buckinghamshir for Offers in excess of £385,000. 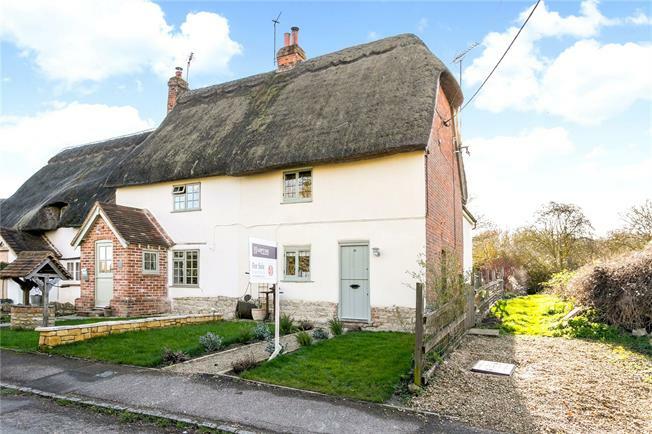 A pretty Grade II Listed thatched cottage dating back to the mid 1700's enjoys many original features throughout. The sitting room has a feature inglenook fire place with wood burning stove and exposed timbers. Flowing through a study area to the kitchen which is tastefully appointed with shaker style units, stone worktops which can easily be enlarged as part of a rear extension, full planning permission has been granted under 18/01994/APP to incorporate the dining room and create a breakfast/family room enjoying lovely views down the long gardens. On the first floor are two bedrooms which are served by the beautiful bathroom with a roll top bath and separate shower and benefits from under floor heating. Located in this pretty hamlet with a strong community, enjoys a wealth of history and areas of outstanding natural beauty, with excellent country walks. The neighbouring village of Dinton also enjoys a village hall, cricket club, historic church with renovated stocks and public house. For more comprehensive shopping the village of Haddenham provides a range of shops, health centre, dentist, library, cafe/restaurants and public houses. There is a good choice of both state and independent Primary Schools, Cuddington and Dinton CofE School nearby (1.19 mile) offers a good primary school and the Church of England combined School in Stone (within 2.02 mile), with nearby Aylesbury offering excellent Grammar Schooling. Whilst enjoying a fine rural setting the village benefits from ease of access to the M40 (junction 7) approximately 12 miles and the Haddenham and Thame Parkway Station providing main line railway services to London Marylebone within 3.5 miles as well as the Oxford to London Victoria coach (Oxford Tube) which stops at Lewkner / M40 junction every 20 mins. To the front of the property there is a pretty garden with level lawn area and central path with flower boards leading to the front door. The rear gardens are a good size and a true delight in this rural setting with established hedging, established trees, shrubs and an area of level lawn. There is a small patio immediately to the rear and a timber storage shed set to the rear boundary with a larger patio area which could be replaced for a studio/entertaining area (planning consents may be required).